HPE Synergy, the first platform built from the ground up for Composable Infrastructure, offers an experience that empowers IT to create and deliver new value instantly and continuously. It is a single infrastructure that reduces operational complexity for traditional workloads and increases operational velocity for the new breed of applications and services. Through a single interface, HPE Synergy composes physical and virtual compute, storage, and fabric pools into any configuration for any application. As an extensible platform, it easily enables a broad range of applications and operational models such as virtualization, hybrid cloud, and DevOps. With HPE Synergy, IT can become not just the internal service provider but the business partner to rapidly launch new applications that become the business. HPE Synergy supports both two-socket and four-socket compute modules which provide the performance, scalability, density optimization, storage simplicity, and configuration flexibility to power a variety of workloads, including business processing, IT infrastructure, web infrastructure, collaborative, and high-performance computing. 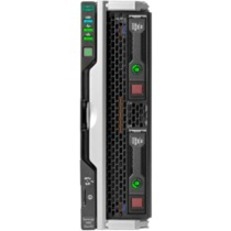 The HPE Synergy 480 Gen10 Compute Module delivers superior capacity, efficiency, and flexibility in a two-socket, half-height form factor to support demanding workloads. Powered by the latest Intel® Xeon® Scalable processors, HPE DDR4 SmartMemory supporting up to 1.5TB, flexible storage controller options, three I/O connectors, and designed to create a pool of flexible compute capacity within a composable infrastructure the HPE Synergy 480 Gen10 Compute Module is the ideal platform for general-purpose enterprise workload performance now and in the future. This part is not currently in stock, but it may be available. Please click on the button below to contact us and we will get back to you within one business day with a price and availability. Physical Characteristics Height - 2.5"